American Airlines flight from St. Louis to Athens. All hotel accommodations (double occupancy), all transfers following arrival at the Athens hotel, 2 meals daily (always including breakfast and almost always dinner), two plane flights in Greece, two boat trips, a day out on a private yacht, all entrance fees to archaeological sites and museums, all lectures and instruction, and all project materials. Tipping is not included, nor are beverages at dinner. Our program has three unique features. It is an interdisciplinary, team-taught project that offers hands-on experience in an effort to understand more deeply both other cultures and our own. Faculty from many disciplines join together and propose activities designed to illuminate early chapters in our western heritage. 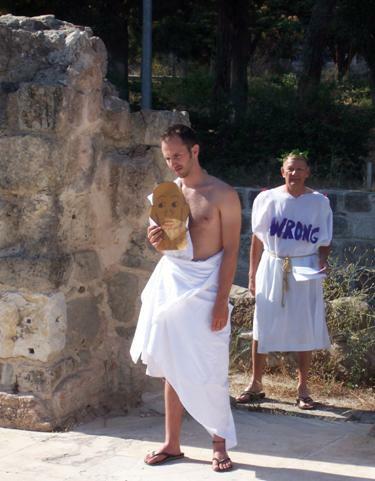 Our seminars are not merely lectures and tours; instead, they encourage participation in diverse activities such as model-making reconstructions of ancient buildings to introduce ancient architectural achievement, recreating ancient debates in the law courts in order to think about ancient institutions of justice, crafting and painting our own terracotta vessels in the black figure and red figure techniques, running an Olympic foot-race in an ancient stadium, dramatically reenacting selections from Plato in their historical settings to invigorate our grasp of philosophical discourse, the construction of sundials as part of an introduction to ancient astronomy, lively recitations of ancient myths each evening at the close of dinner, and performing classical Greek plays in ancient theaters with costumes and masks we make ourselves. We will perform an ancient play in an ancient theater with costumes and masks we make ourselves. Our 2019 theme IDEALS OF EXCELLENCE: Searching For Excellence In Ancient Greece invites seminar members to explore the meaning of excellence in the Greek inventions of institutions fundamental to our western civilization that emerged from a world founded upon mythical explanations. How shall we explain the kinds of excellence in their inventions of philosophy and science, democracy, historical writing and public literacy, and the comedy and tragedy of the theater? To explore this multi-faceted theme, first, we shall investigate important sites and artifacts, written accounts and painted presentations, in order to provide seminar members with ancient evidence. Secondly, we shall engage in reflection, discussion, lectures, and hands-on activities in order to discover how rational explanations of the world burst upon the cultural world of the ancient Greeks. Do the ancient Greeks still have something to offer us as we try to understand the world and our place in it? We want to think deeply about the meaning of our own lives by reflecting upon the ways that life and death became meaningful to the ancient Greeks. In this sense, our project is both an archaeology of ideas and an expedition. It is a physical journey through the mainland and islands of Greece, and simultaneously a search for our own self-understanding. WHO MAY APPLY TO THIS PROGRAM? The program is open to the entire community! We welcome applications from persons of all ages, backgrounds, and interests (minors are welcome if they are accompanied by a parent or guardian), including those who hold foreign passports as well as U.S. citizens. Participants range in age from 18-88 years! It is usual for the group to have a blend of junior and senior members. Couples and families are welcome. We have set a traveling size for our group not to exceed 40 persons; thus, enrollment is limited. You can secure a place for our 2019 program by sending a check for $250.00 made payable to Southern Illinois University Carbondale [SIUC] along with your completed application to: Study Abroad Programs, Southern Illinois University Carbondale, Carbondale, IL 62901-6885. Please see the schedule of costs and payments section for program costs for each option. Each morning we visit an archaeological site and discuss the theme of the day on location. We will re-enact scenes from ancient plays, reproduce a debate in the law courts, and recreate festival processionals in costume. 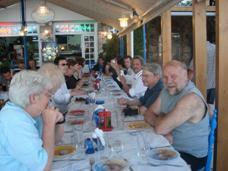 Each night, we have a fabulous dinner, at local tavernas like this one, overlooking the sea. Although we anticipate no changes in the itinerary in either program content or the selection of sites, slight changes in scheduling may occur. This is a consequence of official changes made by the Greek Government regulating boat travel or access to sites. Currently, our program calls for three ferry trips and one domestic plane flight, which are subject to change without notice. From our past experiences in Greece, this has never been a problem but we alert all the participants to the possibilities. Everyone will receive an up-dated itinerary upon arrival in Greece. WHAT OTHER MISCELLANEOUS COSTS ARE COVERED? Included in the program cost are many miscellaneous expenses. All museum fees are included as well as entrance fees to all archaeological sites. Port taxes, all ground transportation, newer air-conditioned buses, and transfers have already been figured into the cost. All project materials such as the clay for model-making exercises, the materials for group projects, and the costume and masks for our production of the play are included in the cost. 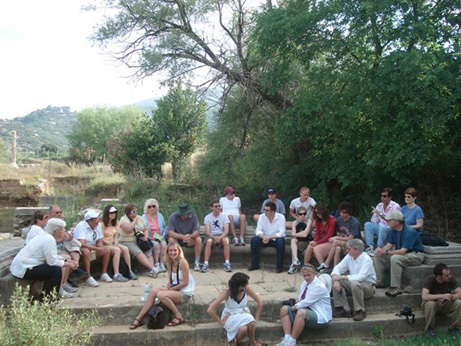 All lectures by our staff and archaeological site presentations are covered. All baggage handling and all tipping are already included. Our program includes many, many extras usually not included in package tours. All dinners are splendid events with selections of fine foods included. Unlike usual tours, we include many more ancient sites than is customary, and optional side trips to modern sites are planned. We encourage everyone to take advantage of these opportunities. The usual tours, on the other hand, include only a few site visits while so many others are available for additional fees. For the thoughtful and motivated traveler the cost of these add-on tours can quickly become very great (and a hassle to arrange) even if the initial price seems modest. Registration for SIUC credit is optional. Participants who choose to take the program for credit may opt for a grade or audit. For travel/study programs, there is no additional cost for "out of state" enrollees: the cost for each participant is $259.80/credit hour or $779.40/3 credit hours (undergraduate) and $350.60/credit hour or $1,051.80/3 credit hours (graduate). There is also a $30 application fee for non-SIUC students applying for credit. This is payable to SIUC and should be a separate check. Credit card payments are accepted for tuition and application fees only. Credit in the program, whether for a grade or audit, is available in Philosophy, Art, Architecture, Art History and/or History. Students may also petition to earn additional credit under the supervision of one of the faculty members for completing an additional project during the summer months, extending from travel research. These additional projects must be completed no later than August 1, 2019. The staff will assist any participant in organizing such additional credit-earning projects. All cancellations less than 45 days prior to the start of the program are subject to a $1,000.00 penalty. All cancellations less than 30 days prior to the start of the program are subject to a $1,500.00 penalty. All cancellations less than 15 days prior to the start of the program are subject to a $2,500.00 penalty. There is NO REFUND due to cancellation after the departure date. To qualify for a refund, all cancellations must be submitted in writing to Study Abroad Programs. Study Abroad programs recommends strongly that all participants obtain separately "Travel Insurance" just in case their plans should change after making program payment. All rates area based on tariffs, costs and exchange rates in effect at publication and are subject to change based on these factors. We begin our expedition in Athens and the mainland where we set out explore the ancient Greek achievements of the 5th and 4th centuries BCE in philosophy, architecture, literature, politics, athletics, historical writing, and the theater. 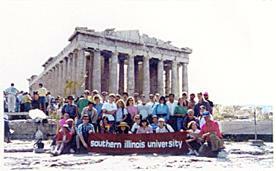 In Athens, we visit the sacred Acropolis and its museum. Then, we walk down to the profane marketplace below, the Agora, to capture a view of everyday life, and visit the haunts of the philosopher Socrates. There we read passages from Plato’s dialogues that vividly depict the life and death of Socrates. The next day, we visit the National Museum to investigate artistic expressions and techniques, focusing on the transitions from the Minoan to the Mycenaean period, and then from Geometric to Archaic to Classical periods. In the morning, we set out for Epidauros, a noted center for theater and medical arts. We visit also the great site of Mycenae in order to investigate the flourishing of the earlier central palace civilization on the mainland, before returning to the Athenian port, Peireus, for our first-class overnight cruise to the island of Crete. After our early morning arrival, we go first to the Minoan site of Knossos as we begin to compare and contrast the Minoans with their Mycenaean successors. Then, we reconstruct the whole site by a visit to the Herakleion museum. Our second day on Crete brings us to two more Minoan palaces, at Phaistos and Malia, in order to grasp more clearly the general layout of the Minoan complexes and to contrast them with both the Mycenaean palaces and the Acropolis of the Classical period that we focused on in Athens. Our third day on Crete offers hands-on activities at a local potter’s shop, making clay models of architectural elements of Minoan and Mycenaean buildings, and making copies of vessels that we have been studying in the museums. Next, we set sail from Crete to the volcanic island of Santorini, whose main town Fira is romantically elevated almost a half-mile into the air from the level of the sea. On Santorini, over a two day period, we visit the ancient Minoan town of Akraotiri, almost perfectly preserved in the volcanic destruction during the Bronze Age, and the Fira museum. On the third day, following our exercises of making a sundial, we set sail for the island of Mykonos where our themes return us to the Classical period. We visit ancient Delos, the sacred island off the coast of Mykonos, and we devote ourselves to the study of ancient drama. In Mykonos, we will perform Aristophanes’ Clouds in a theater with costumes and masks we make ourselves. 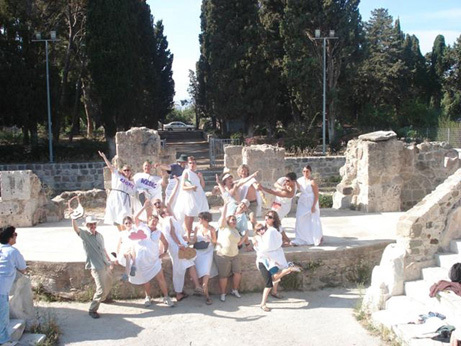 Throughout the expedition, in the evenings faculty will deliver a series of formal lectures on ancient Greek civilizations, participants will learn some modern Greek dancing, and the group will be treated to the recitation of ancient myths at the close of each dinner. Also, each professor will direct a handson project so that all members of our expedition may think more deeply and remember more clearly the many contributing themes of our seminar. Every day on the islands, participants can expect to have most afternoons free for swimming, relaxing, a leisurely lunch, shopping, and so on. And the evening hours after our sumptuous dinners are always free. One way to explore the legacy of ancient Greece is to focus on the articulation and development of self-knowledgethrough cultural inventions that we have inherited and highly prize. These institutional practices include democracy and the jury system, philosophy and western science, historical writing, public literacy, the Olympic games, and the theater. How did the political institution of democracy arise? What legal developments led to the jury system? What were its strengths and weaknesses? What new vision of ourselves is fostered by the advent of democracy? Why did philosophy/science begin in Greek colonies on the west coast of modern day Turkey, and in the eastern Greek islands in the 6th century B.C.E.? Why then, and there? How did these beginnings lead to the vision that self-investigation was the meaning of being human? Why did the Greeks choose to depict the human form at the expense of landscape and setting? Why did this anthropocentric focus arise in the 8th century B.C.E.? And why has this emphasis on depictions of the human form dominated Western Art ever since? How shall we account for the emergence of historical writing? How is it different from the writing of poetry? In what senses do we understand our self differently through prosaic reflections on our society? While we have evidence of literacy, used restrictedly in the administration of central-palace civilizations, in Greece we have the first evidence for the development of public literacy on a much wider scale. How shall we explain its origins and development? In what ways does it lead to deeper self reflection? We can identify the beginning of the Olympic games in 776 B.C.E. Here we mark the invention of a contest-culture in which individual excellence is announced in a special victory. How are ideals of self-excellence transformed by such contests? The invention of the theater takes place when the actions described through poetry appear by actors on stage. Behind masks, an individual reveals a character by literally hiding himself. How does theatrical performance lead to a new social consciousness in which the meaning of self and society are re-examined? The University urges everyone to secure, privately, "Travel Insurance". At this time, no special medical precautions are needed prior to arrival in Greece. However, medical authorities customarily recommend tetanus and booster updates for those who have not had them within the last ten years. Please consult your physician. Participants are responsible for own health insurance. Please verify with your carrier that your health plan is valid overseas. Most are for short periods like the trip, but a few, like Medicare, only work in the United States. Continuing SIUC students may be covered by the SIUC health plan; please confirm with Study Abroad Programs. Southern Illinois University Carbondale reserves the right to decline any application.